Funny, engaging, nostalgic, frank and written with a tremendous swagger… breathtakingly good at evoking time and place. Ride. 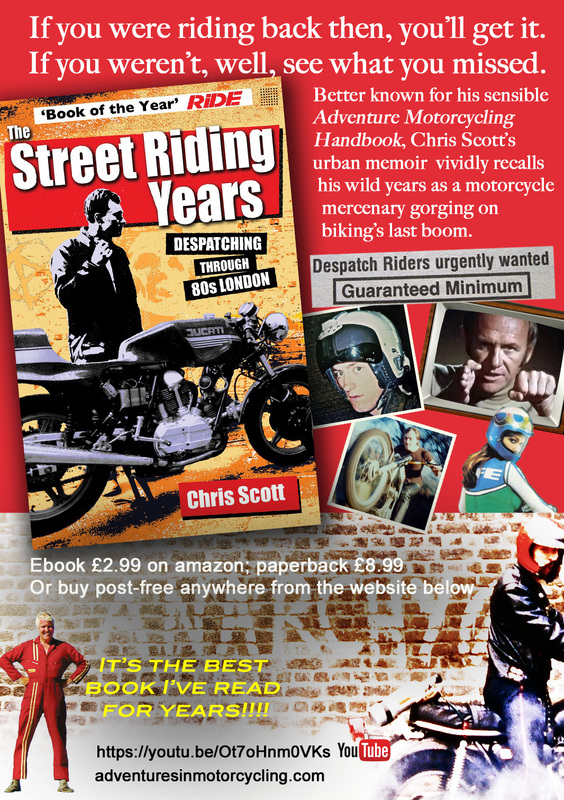 Set in the late 1970s and following decade, The Street Riding Years is a motobiography and a ‘prequel’ to my better known Adventure Motorcycling Handbook. It’s the story of my start on bikes and subsequent years as an urban motorcycle mercenary, a time when badly behaved messengers capitalised on London’s economic revival, when squatting was easy, and when Thatcherism polarised the nation. By the end of the 1980s I’d had many more motorcycles than birthdays, riding everything from classic Brit twins and thundering Italian street racers, to demented dirt missiles and nitrox-injected dinosaurs. My sensible overlanding guides advise how it should be done. The Street Riding Years is not that kind of book. 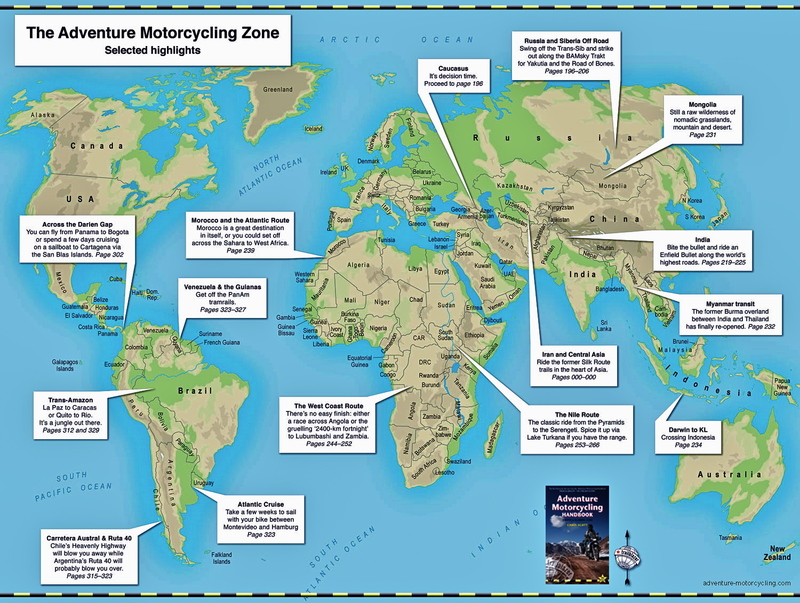 * The Street Riding Years was originally titled Adventures in Motorcycling. It is the same book with a new title. “I read your memoir, enjoyed esp. the early chapters about London dispatching in its heyday. The most enigmatic rider at Addison was a Frenchman who had a rough RD350 on French plates. It was rumoured that he faced a choice of dispatch riding in London or the Foreign Legion, and he took the marginally easier option. But we never found out the truth as he spoke to no-one, But he was faster than anyone else on the circuit. I then went to Interlink Courier for 9 months in 1979 working out of Russell Gardens in W11. I used a brand new new 5 speed MZ that I bought out of a small shop in Stockwell near Pride and Clark’s- the same place where you stole the stickers in the book. The guy was called Barry Sandle- an ex-racer of some kind. Barry unwisely took the CB off me and rebuilt it for sale to some poor punter. Including a trip to Spain, I did close to 30,000 miles in those 9 months- with no rebuilds, no crashes, no traffic convictions, and no breakdowns. Someone up there must have been looking after me but at 22 I took it all for granted. Interlink was set up by ex-dispatchers from the Middlesex suburbs. I knew where things were headed when they plastered the office and their own vehicles with ‘vote Thatcher’ for the 1979 general election. I went back to them for a few months in 1982 to get enough money for a trip to America before starting a ‘real’ job, but it wasn’t the same. I remember my very last dispatch was to deliver an infeasibly large box of fresh salmon to somewhere in the city. The main guy at Interlink (name forgotten) built up the company through diversifying into vans and overnight trunking, won a business leadership award in the 1980s, and sold on the firm on for some millions. Interlink is now owned by La Poste- i.e. the French post office. Tells it how it was and I didn’t start until 1985. Dynamo pushbike couriers wanted novice motorcycle couriers lol but I soon moved on to Supa Fleet in Rufus St, and the axe in the Hackney Rd on pay day that ended my carrier as a DR. At cyc in 2013, having worked with a fair few different firms in my time. If i remember right, interlink in Russell Gardens, was run by a dad and 2 brothers named Gabriel. Did a stint there in 1980 ish after mercury + express. I rem they lived in a country mansion. I worked at Express Despatch, Delta, Addison Lee and West One. I was fairly well known as a nutcase. Would love to hear from anyone who remembers me 1978-1985. I am on Facebook under my name. A great book, really captured era. I was a founding member of the DIWU and worked the City circuit until I got blacklisted. I was a Master of Arts student in London in the early 1980s and supported my studies by despatch riding on a Suziki GT 250.X7. I lived in Islington and despatched for an Islington based rider company that advertised themselves as an anti – sexist despatch company – I cant remember their name but I think there was only 2 young women, myself and one other on their books as riders. Most of the jobs as I recall were graphic design parcels for the record companies in Soho and blood delivery to hospitals..
78-85 – the great years. Fwiw, I hear there is a Courier Day at the Ace Cafe London on Oct 30. Great book Chris it brought back some long forgotten memories of dispatching for the Arab bank from 82/84, how I survived I’ll never know.